We're much more than just trophies. We design and create stamps of all types, styles, and sizes. 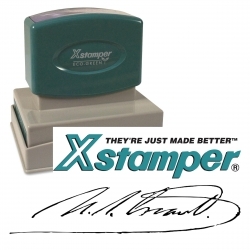 We specialize in self inking stamps and are the manufacturer of ProStamper - a new style of stamp that lasts for thousands of impressions, does not dry out, has 100% repeatability, and lasts a lifetime. We also provide Address Stamps, Business Stamps, Bank Stamps, Notary Stamps, Signature Stamps, and Stock Stamps. If you can't find what you are looking for, please contact us and we will be happy to assist you in your rubber stamp or seal needs. 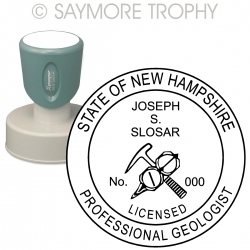 Saymore Trophy is your one stop source for online shopping for rubber stamps. We custom make all of our Prostamper Rubber Stamps in house and can even include your logo for no additional charge. Our stamps do not deteriate or become worn out from usage, so you can re-ink and use your stamp for a long time. For those looking for mechanical or date stamps we have those too! 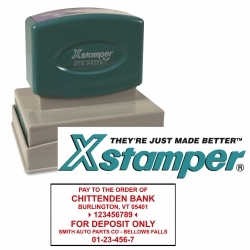 You can choose between self inking date stamps or stamps that use a stamp pad. This is sometimes important if you need to use special ink or if you need to stamp irregular surfaces.